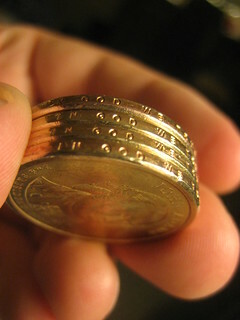 Dollar Coins "In God We Trust"
I was recently forwarded an email call-to-action for people to "boycott" the new dollar coins. The reason? "'IN GOD WE TRUST' IS GONE!!! Together we can force them out of circulation." Ummm...yeah...this really pissed me off because "In God We Trust" is clearly on the side of all of the new dollar coins along with "E Pluribis Unum." The stack I'm holding here is of the first four Presidents released in 2007. I really wish people would do their homework before sending reactionary emails.